Seattleites flock to Bend, Oregon, each year for many reasons: the reliable sunshine, the river rafting, the hiking, the fishing, the golfing—and yes, the lazy river float. The Deschutes River flows through this central Oregon town like a super-chill water-park ride. 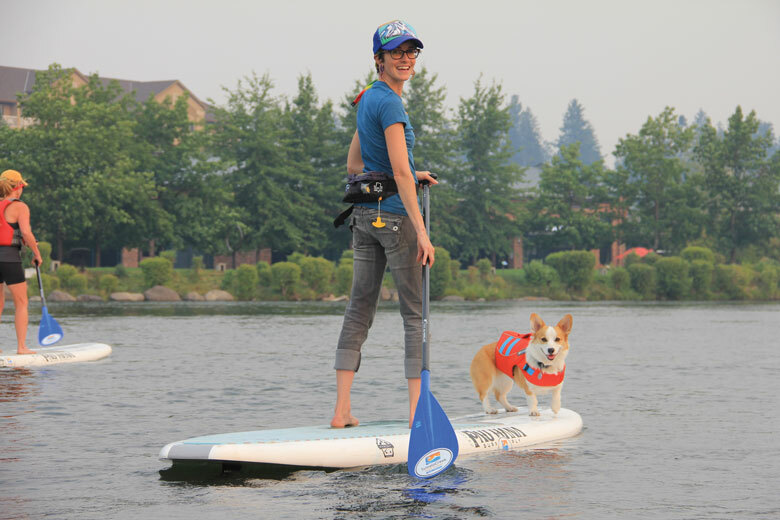 Every summer, throngs of people (and even their pups) float along this real-life lazy river on inner tubes, in kayaks and on stand-up paddleboards (SUPs) for 1.5 relaxing miles. It’s one of Bend’s best features, and the city makes it easy for everyone to get their feet wet. 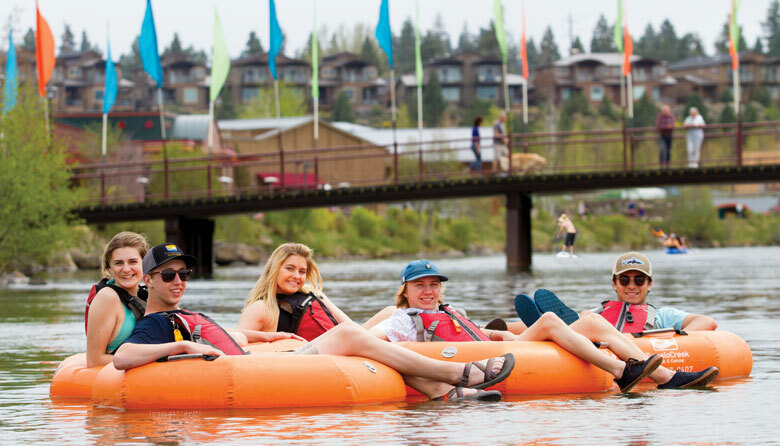 Rent a tube, SUP or kayak at Tumalo Creek Kayak & Canoe near the shopping-centric Old Mill District. Or head straight to nearby Riverbend Park, where you can rent from the Sun Country Tours mobile kiosk. Sure, you can BYO flotation device, but submerged branches and rocks put flimsy pool floaties in peril. From Riverbend’s shallow beach, it’s about an hourlong float to picturesque Drake Park on the edge of the city’s cute, bustling downtown district. As you slowly drift, feet trailing in the icy water, lay back and do a little bird-watching. You’ll likely have a few lazy ducks drifting beside you, their webbed feet barely bothering to paddle as they let the water move them along. Before you know it, you’ll approach the Colorado Avenue Bridge, which marks the beginning of a very short run of Class II rapids. There are three channels: the Habitat channel, for wildlife only; the Whitewater channel, where surfers and whitewater kayakers ride the waves; and the Passageway channel, which allows floaters to pass through. Follow the signage or simply get out and walk (especially if you have a SUP or young kids in tow). The short portage path passes into McKay Park, where you can reenter from the beach. When you get to the Galveston Bridge (Galveston Bridge Avenue), start making your way over to the right bank of Drake Park, where the Ride the River shuttle awaits to take you back to the starting point for another round—or three. If you go: Bend, in central Oregon, is about a six-hour drive south of Seattle. The Sun Country Tours rental kiosk at Riverbend Park (799 SW Columbia St.) is open from 10 a.m. to 5:30 p.m. daily through Labor Day. Inner tube rentals are $10-$15/two hours, $45/day; SUPs are $20/hour. Life jackets are included and required by state law for boaters, paddleboarders and kids younger than 12. Tumalo Creek Kayak & Canoe (805 SW Industrial Way, Suite 6; 541.317.9407) is right on the Deschutes. Inner tube rentals are $15/two hours; SUPs and kayaks are $40/two hours, $80/day. The Pine Ridge Inn (1200 SW Mt. Bachelor Dr.; 800.600.4095), just steps from Riverbend Park, has suites overlooking the river. The Ride the River shuttle service from Drake Park back to Riverbend Park costs $3/person, and the pass is good all day. The stretch of river through Bend is a bit urban, taking you under pedestrian bridges and past riverside homes with lucky residents enjoying cocktails on their docks. If you want a longer trip with fewer people and a lot more wildlife, head about 17 miles south to the Sunriver Marina, within the planned resort community of Sunriver. It has all the rentals you need plus a shuttle van, and an assortment of launch and takeout spots means floats can range from one to five hours. The Deschutes is just as sleepy along this stretch, but the scenery is far wilder. It’s common to see deer grazing and bald eagles soaring. And keep your eyes peeled for river otters along the banks.